"A Pickpocket in Custody," for Chapter 6, "The Hospital Patient" in "Characters," by Charles Dickens in Sketches by Boz, originally published in The Carlton Chronicle on 6 August 1836, and illustrated by Cruikshank for the 1839 Chapman and Hall anthology. About a twelvemonth ago, as we were strolling through Covent-garden (we had been thinking about these things over-night), we were attracted by the very prepossessing appearance of a pickpocket, who having declined to take the trouble of walking to the Police-office, on the ground that he hadn't the slightest wish to go there at all, was being conveyed thither in a wheelbarrow, to the huge delight of a crowd. Some question appeared to have been raised about the identity of the prisoner; for when it was agreed that the two magistrates should visit the hospital at eight o'clock that evening, to take her deposition, it was settled that the man should be taken there also. He turned pale at this, and we saw him clench the bar very hard when the order was given. He was removed directly afterwards, and he spoke not a word. — "The Hospital Patient," Chapter 6, "Characters," p. 178-179. Macrone must have been startled by Dickens's sudden announcement on 3 August  that he had contracted to write a fortnightly series of 'short sketches', half the length of those written for the Chronicle or Bell's, for a new periodical called The Carlton Chronicle and National Conservative Journal, the first number of which would appear in three days' time. The Carlton's editor, Percival Banks, would pay well, Dickens told Macrone, and as his circulation was small these sketches would not injure sales of Boz's second series — in fact, since the magazine circulated 'all among the nobs' they would probably enhance the book's sales. The Carlton series was to be called 'Leaves from an Unpublished Volume by Boz (which will be torn out, once a fortnight)'. Robert Patten's comment is apposite: 'One wonders just how happy Macrone was to find out that Dickens was selling his copyright a second time over. In the event Dickens contributed just two sketches to the Carlton, 'The Hospital Patient' (6 Aug.) and 'Hackney Cabs and Their Drivers' (17 Sept.). The long gap between the appearance of the first and the second sketch probably resulted from the sheer pressure of Dickens's other commitments at this time. — Michael Slater, "Break-Trough Year: 1836," p. 76. The brutal story has had not much attraction for Dickens's later illustrators as it has far more in common with the Whitechapel scenes of The Adventures of Oliver Twist; or, The Parish Boy's Progress. Significantly the single 19th c. illustration available for this gritty sketch of London underworld, that by George Cruikshank for Marcone's "Second Series" volume redrafted for the 1839 Chapman and Hall volume, does not depict the Nancy-like figure who desperately tries to save her brutal common-law husband from a life of crime and ultimately the gallows at Newgate. 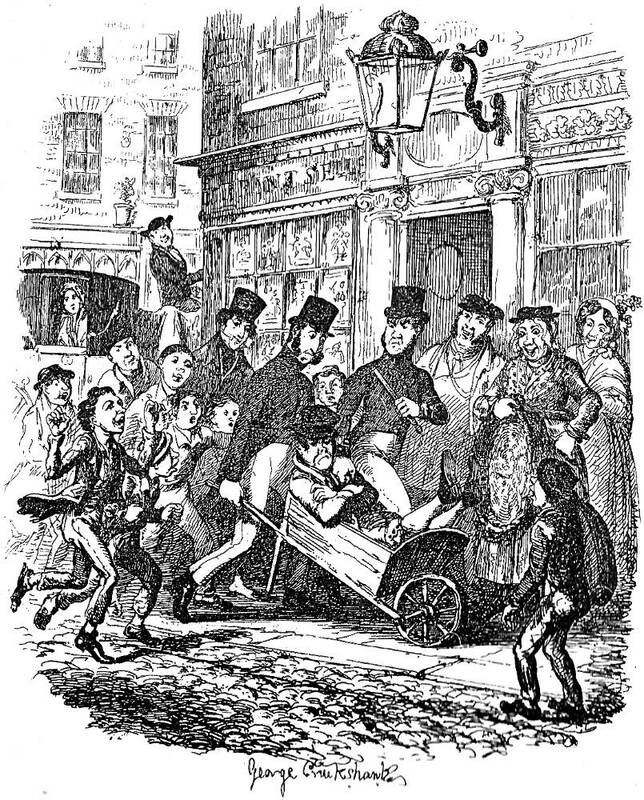 Rather, Cruikshank has depicted the Covent Garden street scene in which three constables drag the pickpocket off in a market-garden wheelbarrow as eight street-boys ridicule the thief and five civilians look on approvingly, one woman actually smiling at the thief's ignominious treatment. In other words, although the sketch offers plenty of material from the darker side of human nature, the illustrator has elected to depict an essentially comic scene which "delights" the bystanders because his apprehension and punishment appeal to their sense of poetic justice. There is not the slightest suggestion of karma in the ensuing scene in which an "ill-looking young fellow" (179) who will eventually become Bill Sikes is charged with having assaulted his common-law spouse with unusual ferocity. However, whereas Sikes would have cursed the police magistrates when they determine that he should be present at her hospital bedside when she gives her deposition, this unnamed brute merely clenches the bar and turns pale. Dickens may have also felt he was not getting sufficient contrast in the work (i. e., the Pickwick Papers) since the only touch of darkness amidst all the fun of Pickwick V and VI is Sam's teaching Pickwick (ch. 16) about those lost in destitution's abyss, 'the worn-out, starving, houseless creeturs as rolls themselves up in the dark corners 'o them lonesome places'. Sam's description of the dry arches under Waterloo Bridge is, in fact, a Boz sketch in miniature, and he can be seen as, among other things, a racier, fully characterised, successor to Boz in Dickens's oeuvre. Chiming with this passage in Pickwick is the starkness of Dickens's first Carlton piece 'The Hospital Patient', written more or less contemporaneously. His discrete sketches give him another outlet for the non-comic writing that has to be confined to the inserted tales in Pickwick, and he may well have preferred making his dé but in this journal of the 'nobs' with something more in the vein of his much-admired 'Visit to Newgate' than with the kind of humorous/satirical street sketch for which Boz was most celebrated, and of which he second Carlton piece, about metropolitan cab-drivers, was to be a fine example. In 'The Hospital Patient' he comments on the 'miserable creatures' who can be seen lingering about the streets late at night and the sketch culminates in his third deathbed scene, one that is rather more complex in its effect than its predecessors. A woman dying in a hospital having been savagely beaten by her partner, but the scene is neither simply pathetic as at the end of 'Our Next Door Neighbour' nor simply horrific as in 'The Stroller's Tale'. — Michael Slater, "Break-Through Year: 1836," pp. 76-77. Cruikshank establishes the urban context clearly by the carriage in the background, the cobblestone street in the foreground, the large lantern, the ionic columns, and the thick glass panes of the restaurant, as well as by the windows of the residential building, upper left. The thief looks suitably glum as the swallow-tailed, top-hatted constables cart him away to the Bow Street Police Station (Station E, closed in 1992). The three law-enforcement officers are "Bobbies" or "Peelers" of the new police force created by Home Secretary Sir Robert Peel just recently (1829); they are neither mere "watchmen" of the type described in the latter part of Oliver Twist, nor river police, nor Bow Street Runners — those urban forces amalgamated the year following Dickens's writing this "police" sketch: their uniforms here and the truncheon carried by the leader are consistent with pictures of Bobbies from the period. To appear neutral, the [new force's] uniform was deliberately manufactured in blue, rather than red which was then a military colour, along with the officers being armed only with a wooden truncheon and a rattle to signal the need for assistance. Along with this, police ranks did not include military titles, with the exception of Sergeant. . . . . Between 1829 and 1830, 17 local divisions each with its own police station were established, each lettered A to V, allocating each London borough with a designated letter. These divisions were: A (Westminster); B (Chelsea); C (Mayfair and Soho); D (Marylebone); E (Holborn); F (Kensington); G (Kings Cross); H (Stepney); K (West Ham); L (Lambeth); M (Southwark); N (Islington); P (Peckham); R (Greenwich); S (Hampstead); T (Hammersmith) and V (Wandsworth). — "History of the Metropolitan Police Service," https://en.wikipedia.org/wiki/History_of_the_Metropolitan_Police_Service (accessed 15 May 2017). Dickens, Charles. The Adventures of Oliver Twist. Illustrated by James Mahoney. The Household Edition. London: Chapman and Hall, 1877. Dickens, Charles. "The Hospital Patient," Chapter 6 in "Characters," Sketches by Boz. Illustrated by George Cruikshank. London: Chapman and Hall, 1839; rpt., 1890. Pp. 178-181. Dickens, Charles. "Shy Neighbourhoods," Chapter 10, The Uncommercial Traveller. Illustrated by Edward Dalziel. The Household Edition. London: Chapman and Hall, 1877. "History of the Metropolitan Police Service." (accessed 15 May 2017) https://en.wikipedia.org/wiki/History_of_the_Metropolitan_Police_Service.